NHC Director Dr. Rick Knabb turns the tables on NHC Public Affairs Officer Dennis Feltgen, who authors this monthly feature. Public Affairs Officer at the National Hurricane Center. Does that make you a meteorologist, a TV person, a TV meteorologist, or all of the above? All of the above and more! It starts out as a meteorologist, which led to nearly 30 years as a TV meteorologist, which led to NOAA, which led to its hurricane center, and here I am. What did you glean from your career in the media that really lets you do your job here? I have a great advantage in that I got into media when it was fun. It wasn't in its infancy but it wasn't very high-tech yet. I began doing TV weather in the era of the Plexiglas map and the magic marker. There was no teleprompter, no graphics, and no green screen. It was just me, the map and the camera for five minutes. I had to be very good at explaining things in an understandable manner. I am doing the same thing here, explaining a complex, even threatening, situation in such a way that people will understand what I am talking about and are able to use the information wisely. You love the communications here but you also love the meteorology. Oh yes, I love the meteorology. I was bitten by the weather bug at eight years old; growing up in South Florida in what is now Oakland Park. It was Hurricane Donna in 1960 - just a glancing blow, but I was fascinated with everything going on around me, including the media coverage. Fast forward to 1964 and a direct hit by Hurricane Cleo, and that was it. I knew I was going to become a meteorologist. It wasn't until my senior year at Florida State University that I decided to go into television. A day in the life of someone who works in television isn't what it used to be, now with the advent of the web and social media. And we have to engage the media from here on all of those platforms. How has that evolved and increased the challenges here at NHC? Social media gives us more avenues to get our message out. It's no longer someone showing up at the hurricane center with a film camera, grabbing an interview, taking the film back and developing it and hoping it makes it on the air at 6 pm. Everything now is live, it's instant. Media come here with the live cameras and microphones, iPhones and iPads, and they're tweeting. We have to make sure our message is consistent on all of these platforms. What is the media pool and how does that work? If we have a Hurricane Watch issued for U.S. soil, there's going to be a great deal of media attention. Obviously, we can't have 50 television cameras in the media room. I am sure the fire marshal would want to talk to us. Plus logistically, it just wouldn't work. So, we set up the media pool. It consists of one camera. Local and national media outlets have five-minute windows with the opportunity for live interviews with the NHC director, deputy director, or the hurricane specialist unit branch chief to discuss the approaching hurricane. My job is to coordinate it, first by arranging for a pool producer and photographer,sending a media advisory announcing the start of the pool and the contact information to arrange interviews, and keep it going for the duration of the event. But there's more to it, right? Right, that's just the television part. There is also radio, where I record the audio portion of the top-of-the-hour live generic TV broadcast and post it on the NHC website just a few minutes after the TV broadcast. These are very useful for radio stations and print outlets. We are also taking advantage of the Internet, experimentally, by providing a link on our website to a feed of these top-of-the-hour TV broadcasts. They are accessible to anyone with a computer or smartphone. And to top it all off, I am flooded with phone calls from media outlets and the general public that I respond to as well. It is often an 18 hour plus day. Outside of the hurricane season, what is involved in what you do to help get our message of preparedness out? The offseason is spent getting ready for the approaching season. The media may spend the first part of the offseason looking back at the previous season, especially as some of the tropical cyclone reports are issued. But after that, everyone is looking forward. Some TV stations have hurricane specials, so I arrange the interviews they need. I am heavily involved in some of the national hurricane conferences, making presentations and facilitating media interviews for on-site NHC personnel. There are also a number of webinars for both media and schools that are done here. It's a more expanded role than the one my predecessor had, and that's a good thing. We want to use every avenue available to get the message of preparation out. What are some of the future opportunities to do that? We are exploring the use of video, much more than we ever have. We have to meet the 508-compliance (close captioning) rule and we are finding avenues to do so. The videos could be updates on the season, something educational, but the topics are endless. I also want to re-engage the local media of South Florida. It's been nearly eight years since a hurricane a struck here and I have some concerns. 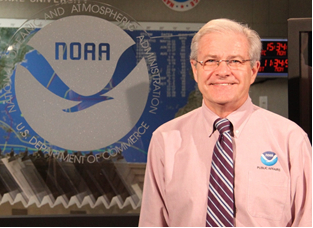 What is it like working with the NHC specialists, the NHC director and the media at the same time? Everyone is focused here, and that is a big plus for me. I can't say enough about the hurricane specialists. One of them was a classmate of mine at Florida State. I recognize that they all have their own personalities, but they all have the same job to do. My job is to make sure they can do their job of getting the hurricane advisory package out without being interrupted by media. Occasionally, it means having a conversation with a particular media outlet that is in violation. Once the advisory is out, I can get the media to where it needs to go. As for you, the director, I know that your schedule is incredibly demanding. And sometimes, it is hard to track you down. But I have found the best way to locate you - send a text to your smartphone. How have you enjoyed being the interviewee instead of the interviewer? It's very different. I expected a few more aggressive questions, but that's okay! I am not complaining.